If you want to call yourself a true Kiwi, you really should be able to find the Southern Cross in the sky. We've covered that in a previous column so this month we're going to use the cross to find south, and by extension, the other cardinal points. To be honest this should also be a required skill for all kiwis. Once you find the cross you're already looking in the general direction of south, which may be good enough, but we can do better. The Southern Cross is not always the "right way up". It moves in a circle around a point in the sky called the South Celestial Pole. As it moves it rotates so that the bottom star of the cross (Acrux) always points to the middle of the circle. When the cross is at the top of the circle it's the right way up, when it's at the bottom (and very low in the sky), it's upside down. Step 1: If the cross is either the right way up or completely upside down, it's already due south. You're done. Step 2: If the cross is on its side, it will be either to the left or right of south. This is where you need to bring in another star to help. Draw a line from what would be the top star of the cross if it was the right way up (Gacrux) to the bottom star (Acrux), then extend the line and keep going until you find the next bright star (Achernar). The distance to Achernar is about eight times the length of the cross. Point one hand at Gacrux and one hand at Achernar. Clap your hands together, then bring them straight down until they are pointing towards the horizon. Your hands are now pointing south. 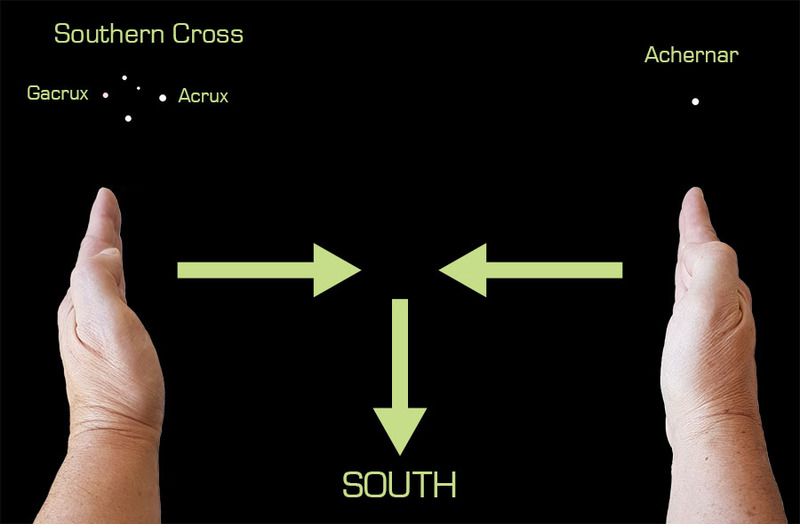 With time and practice you won't even need to do the hand-clapping part, you'll be able to identify south just by glancing at the Southern Cross. That's when I'll call you a real Kiwi. If you're not sure which star is Achernar, you can look it up on a star chart app to check that you've got the right one. You may prefer a different method to find south so feel free to look up techniques that other people use.